A serum does something bonus – it brightens, slows the onset of lines and wrinkles, it tightens, it exfoliates, etc. Serums can be essentially a face oil blend with an extra ingredient(s), or it can be an oil-free base of aloe or an emulsion of oils and floral waters, or any number of other things. Serums vary wildly in texture and use. Some replace your face oil (because it’s basically one), and others are sticky and do not wear well alone at all and must be layered with a face oil or cream. So where should you start when you make the decision to incorporate an oil and/or serum into your routine? There’s a great resource/reference site called rank and style that uses algorithms to search the internet to determine which products are selling the most and getting the best blogger, editor, and industry recommendations, and then synthesizes all the info they collect to put out top 10 lists on just about everything, from specific items like puffer jackets or yoga mats, to all-natural face oils or brown ankle boots. I must admit I was skeptical at first, but I knew that since I’m familiar with all of the natural serums on the market, this would be a great list to test how spot-on their data collection really is. I was super happy when their list, which you can check out here, included all great, all truly green options, all of which I can give my stamp of approval. I didn’t include them in my pic above because I’d used up my stock of them, but in addition to those you see, I’m also huge fan of the serums from Tata Harper and Burt’s Bees, which came in at numbers 3 and 5, respectively (very different price points, but both really great). You may know me to mention this site: Spirit Beauty Lounge from time to time (that means all the time). I’ve gotten to know Spirit over the years and hands down, she’s the most knowledgable person I know when it comes to all things green beauty. 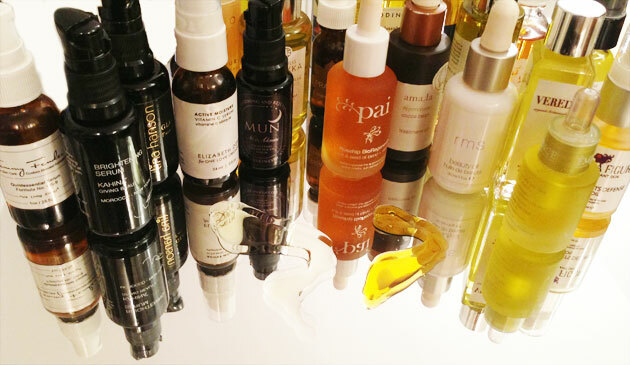 Check out her thoughts and recommendations on oils and serums here and here. She’ll send you samples so you can see which your nose (the aromatherapy aspect is key for me) and your skin respond to the best before you commit to full containers – but I can assure you, there’s not one on her site that I don’t like. A funny side note: A while back Spirit and I were at lunch and she asked which serum I was using. I told her I was fearful of serums because of my constant outbreaks, and that I’d basically stopped using everything on my skin. The look of disappointment that spread across her face told me that my understanding of serums was off, and she promptly schooled me. I’ve been using serums ever since and have seen a HUGE improvement in texture, lines, and coloration of my skin, and even a decrease in outbreaks. Who knew? Finally, this cheat sheet article on Birchbox.com, in which Los Angeles aesthetician, Rita Csizmadia is interviewed, really helps break down why you should be using an oil/serum, and specifically which types of oil are best for your skin. WHAT ABOUT THOSE OF US WITH SUPER SENSITIVE SKIN? SHOULDN’T WE STAY AWAY FROM THESE PRODUCTS? We’ve all been made to fear oils and oil-based serums – especially those of us who break out easily – because of oil-free product-marketing that has been heavy in the media for decades now. I can attest, however, that for *most* people, incorporating a serum or an oil into your weekly (if not daily) routine is beneficial. The only times I’ve seen problems is when A. I applied oils to models who don’t frequently exfoliate, therefore the oil or serum wasn’t able to penetrate into the skin, onto which I then piled foundation, concealer, and powder for a day – or week! – of photographing, or B. when I used a very active serum – one that is chock full of high doses of plant extracts – on highly sensitive skin (like my own), and the skin just straight away had an allergic reaction to it, and got all red and bumpy. If you have eczema or rosacea you may benefit greatly from a gentle face oil or serum, and you may want to top it off with a moisturizer to help strengthen and protect the external layer, as well. If you’re acne-prone, do not fear – the most wonderful thing about oils and serums is that they penetrate quickly, which means they don’t have waxes and other heavy components to sit on top of the skin and clog pores. Finally, know that if one oil or serum breaks you out in pimples or a rash, that doesn’t mean they all will. Keep trying until you find one that doesn’t, and remember that you don’t necessarily need to use it daily. Sometimes a bi-weekly application is more than enough to keep those deeper layers of skin hydrated and plump. There are numerous variations in ingredient lists, and it’s a good idea to familiarize yourself with which oils and extracts are right for your skin. The above links will help you do just that. On freshly washed skin that is still damp from washing, OR on freshly washed skin that has been spritzed with a hydrating spray, apply a few drops of your product with your freshly washed fingers. Gently glide the product across your forehead, cheeks, chin, and give yourself a gentle massage, gently pressing it into your skin, making sure to bring it down onto your neck, and the area of skin below your collarbone, even down to your chest. You’ll notice that a little product goes a long way when you apply it to damp skin. Allow the product to sink in for a few minutes before applying your moisturizer (if you determine you still need one) and your makeup, and if you’re a nighttime applier, be sure to complete your regimen long before your face hits your pillow to allow maximum absorption time. Let us know what you’re using that you love, and how you would describe your skin before and after you discovered oils and serums, here, on the Facebook page for this blog. Do I need to include a disclaimer line here? Just in case, here goes: You all know I’m not a dermatologist, nor a scientist. I’m just a person who looks at, touches, and learns about different skin on a daily basis. I also ask a ton of questions and do a ton of research. Finding an aesthetician, dermatologist, or holistic health care practitioner you feel you can trust is wonderful, but I believe we each have the responsibility and the ability to do some of the research about what’s going to benefit us by ourselves, for ourselves.